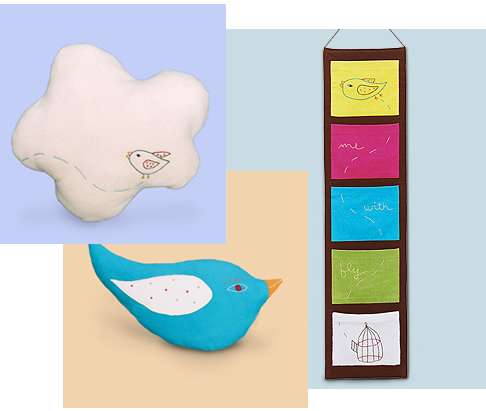 I've written about Zid Zid Kids before, but I never noticed their cloud and birdie pillows or the adorable wall hangings with pockets for storing paper, crafty items, lotions and powder, etc. I had wall hangings like these when I was growing up, created by my mother and aunt, and I remember how much I liked (and used!) them. Visit Zid Zid online to view their complete catalog. If you don't have kids, you may still find yourself drawn towards some of their items for yourself. Don't forget to bookmark them for gifting friends or for the perfect baby shower present.